TAMPA, Fla. – April 6, 2016 – The Forensic Training Academy, announced today that they are hosting Summer Training Institute 2016 at John Jay College of Criminal Justice June 13 – 17, 2016. Attendees will participate in in-person workshops with internationally renowned experts in the forensic mental health field. 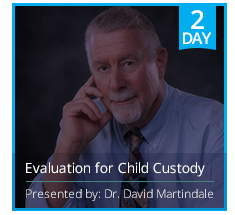 One key professional training program is the Evaluation for Child Custody 2-day workshop presented by Dr. David Martindale. Dr. Martindale is a forensic psychology expert with focus on Custody Evaluations. Dr. Martindale will provide an introduction to custody and parenting evaluations, and will address seven advanced topics, including: Relocation requests, allegations of intimate partner violence, child sexual abuse, and alienation. This in-person workshop is relevant for psychologist, psychiatrists, and other mental health professionals and those who intend to add evaluation for child custody to their clinical practice. * Learn how to effectively managing pre-evaluation contacts with attorneys, litigants, and the court; how to develop a detailed statement of understanding; and how to conduct forensic interviews of adults and children. * Focus on evaluations that involve relocation requests, and allegations of intimate partner violence, child sexual abuse, and alienation. It will also address report writing, testimony, and risk management procedures. For more information on 2016 Summer Training workshops, visit the information page. For more information on our instructors, visit Our Instructors page. The Forensic Training Academy at John Jay College of Criminal Justice is directed by Dr. Patricia Zapf. In addition to offering in-person world-class professional training, the Forensic Training Academy provides the opportunity for students to build research around our training programs. Each training program offered by the Forensic Training Academy is eligible for Continuing Education (CE) credit, through Consolidated Continuing Education and Professional Training (CONCEPT).